JACKMASTER has admitted to sexual assault at Love Saves The Day festival in Bristol back in May. 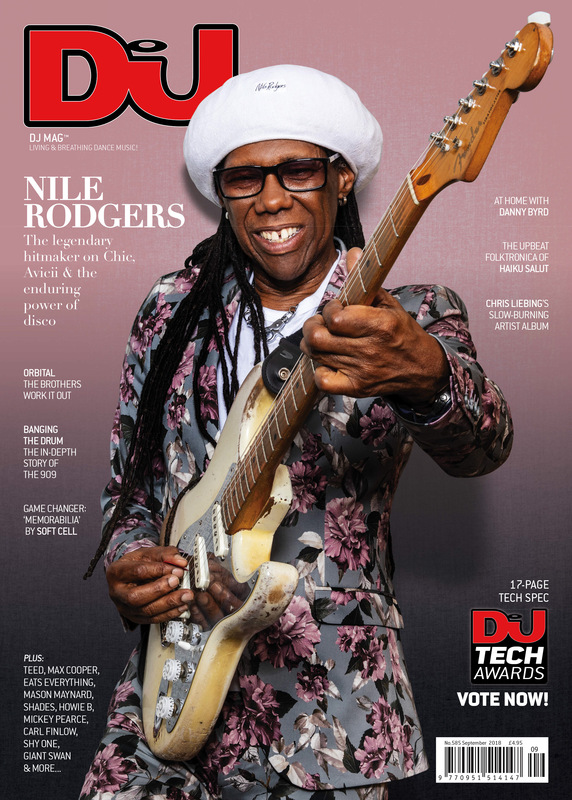 As DJ Mag went to press, the Scottish DJ had been taken off autumn nights at Warehouse Project in Manchester and Motion in Bristol following the revelations. The assaults first became public knowledge when Jackmaster issued a statement on 13th August on his Facebook page. Then, as a bizarre symptom of the internet, this news quickly got twisted on social media into an exploit involving a kitchen appliance — somewhat eclipsing the actual events. By the end of the week, Jackmaster — real name Jack Revill — sought to clarify the situation. His first statement had alluded to unspecified “inappropriate and offensive” behaviour, but in the new statement he said: “The situation is no laughing matter, and the post was far from a means to paint myself in a positive manner. I was abusive and acted lewdly and inappropriately towards numerous members of staff at the festival — both female and male — during a drug-induced blackout, which I had put myself into after my performance by drinking a substance called GHB.” GHB is an odourless drug that generally comes in liquid form, and can induce feelings of euphoria, as well as loss of consciousness in those who take it. “During the ensuing blackout, my actions involved attempting to kiss and grab people against their will,” Jackmaster continued. “I am truly disgusted and ashamed of myself, and I do not wish to use my substance abuse as an excuse for my actions. This type of behaviour should not be tolerated — and was completely out of character from me. I have let myself, staff at the festival and those closest to me down. Although I don’t recognise the person recounted to me, I alone take full responsibility for my actions and the effect on those involved.” After the incidents at Love Saves The Day, Jackmaster — who was on the cover of DJ Mag last July — and members of his management team met with representatives of Love Saves The Day in order to work out what further steps should be taken. In a statement, one of the women assaulted by Jackmaster elaborated: “Jack agreed to meet directly with all the staff his actions had affected on the night to offer his apologies. In that meeting, I was able to directly address Jack to tell him how humiliated and upset his behaviour made me feel and the fact it’s something that hasn’t left my mind since it happened. “The meeting environment was quite intense; I was afraid to see him again even though he had reached out to me before the face-to-face to offer his apology,” the anonymous woman continued. “There was an agenda, but before we had started, he had said that he would do whatever it takes to make us all feel better. If we wanted him to go hand himself into the police right now, he would do it, offer a public apology, whatever it took to make us all feel better again. I could see and feel he was completely sincere in what he was saying. He said he was disgusted by his own behaviour and that this had been the catalyst for him making real changes to his life.” The female member of staff also expressed disappointment that nobody had stepped in to rescue her from Jackmaster’s assault on her. “What made the matter worse is that it happened in front of so many people, and so many witnesses, and it took far too long for anybody to step in and try to take control of Jack or intervene in the slightest,” she said. “People just stood by like it was OK behaviour… Everyone has a responsibility to intervene when they see something like that happening, and if they don’t feel they can step in, they should go and get help.” At the meeting it was agreed that Jackmaster should make a public apology that would act as “a marker in the sand”, and that the police wouldn’t be called. DJ Mag understands that Jackmaster is taking some time away from DJing to ‘work on himself’ — to undergo an extended period of counselling/ treatment over the coming weeks and months. “Jack has committed to take steps to ensure he never repeats his behaviour in the future, and we all appreciate this, but this is not just about Jack, this is about the industry as a whole and making sure that any kind of behaviour like this is stamped out,’ the organisers behind Love Saves The Day said in a statement of their own. “None of our staff wish to pursue the matter any further and have accepted his apologies and support his undertaking to move forward from this in the right way.” Motion in Bristol reacted quickly to the news. “In light of recent events… and as a mark of respect to those affected, Motion and Jackmaster have mutually agreed for Jack to not appear at our upcoming This Is In:Motion event,” they tweeted. “As always, Motion operates a zero tolerance policy toward any behaviour of this kind.” Revill’s forthcoming show at Warehouse Project in Manchester was also cancelled, while his management — Grade — pledged to help him make amends in the public eye and get help. Social media had been quick to jump on the joke meme that started doing the rounds following Jack’s initial statement, but was less vociferous when it came to the actual sexual assault incidents. Some electronic music fans accused top-flight DJs of remaining silent about the Love Saves The Day incidents, due to Jackmaster being friends with a lot of them. In terms of calling out Jackmaster on Twitter, only B.Traits from BBC Radio 1 and South London UK funky stalwart Roska really appeared to have done so as DJ Mag went to press. “I support @LSTDBristol and am also disappointed in @Jackmaster’s unacceptable behaviour,” tweeted B.Traits. “This is a reminder that we all have a responsibility to speak up when we see something like this happening.” “i bet if a black person did all that crud at LSTD, all these online publications wouldn’t be backing us like they’re backing Jackmaster,” said Roska. “I do love Jack, but I said this exact same thing to @HoneyDijon,” replied Chicago house don Derrick Carter.